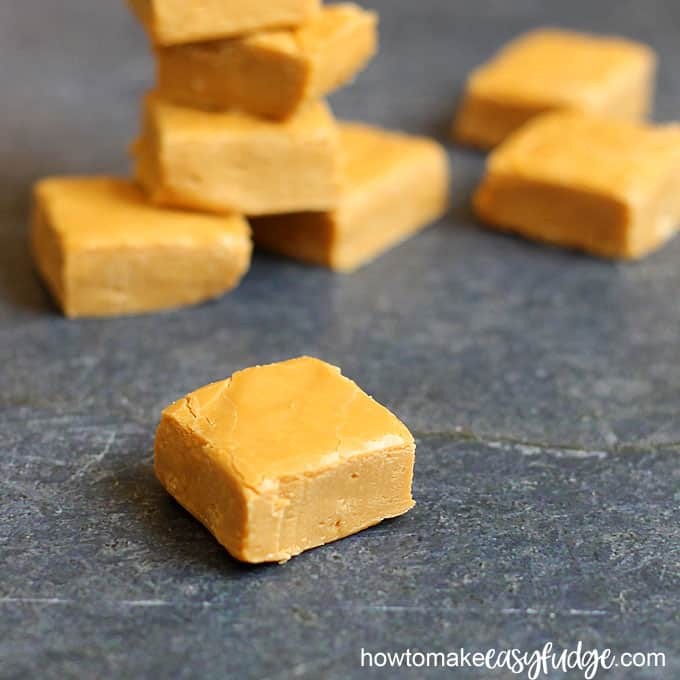 BUTTERBEER FUDGE: Easy, homemade fudge for a Harry Potter party. 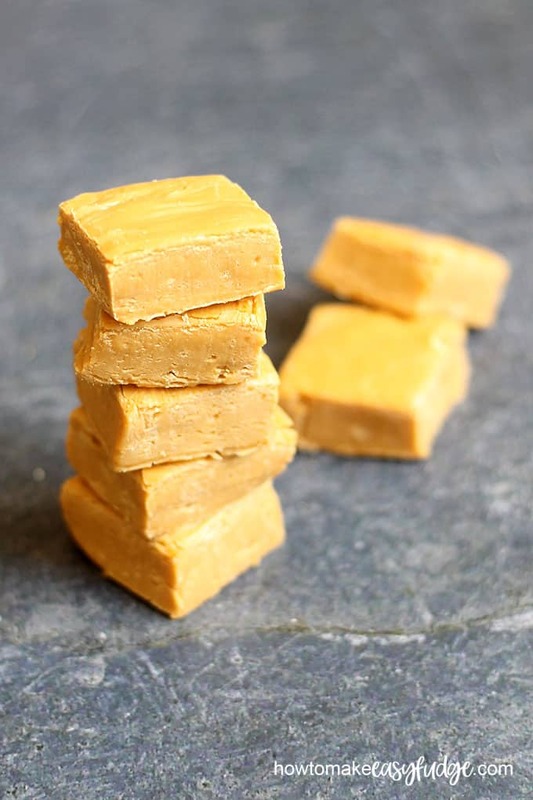 This butterbeer fudge will bring you right inside the pages of Harry Potter. With only four ingredients, and prepared in minutes in the microwave, it’s the perfect Harry Potter party treat. I’ve been a fan of the Harry Potter books since the beginning, when I bought my first copies in 1998 (long before I had my own children). So I was just as filled with glee to visit Harry Potter world at Universal as my daughter was. If you visit, be sure to stop by Hogsmeade for a mug of butterbeer (Harry, Ron, and Hermione’s drink choice) and pop in Honeyduke’s candy shop for some butterbeer fudge. This homemade version is just as delicious! 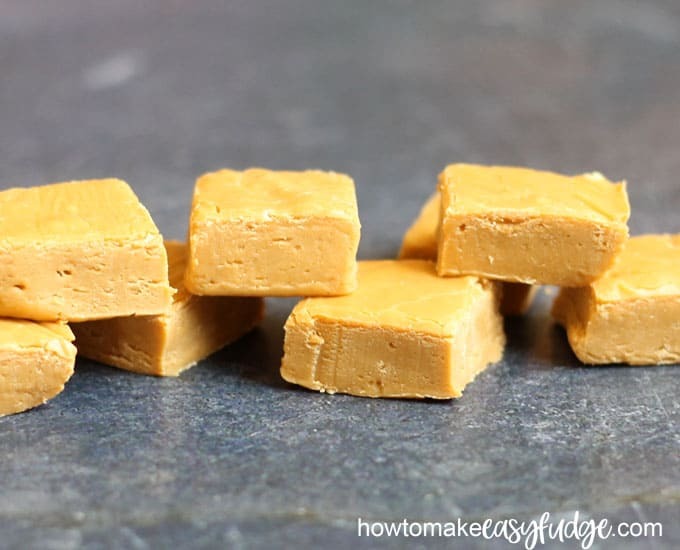 As with all of the fudge recipes on this blog, this fudge is super easy to make. 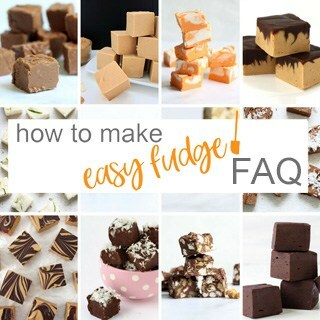 To learn more about making easy fudge, check out our FAQ page. And if you’re all about Harry Potter fun food, you can also make these Harry Potter marshmallows with food coloring pens. 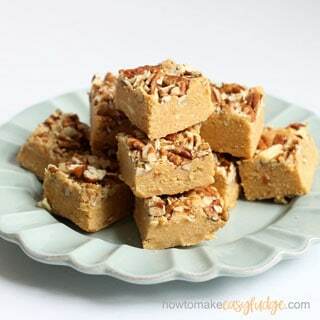 I use either the smaller, 8-inch square baking pan so the fudge is on the thicker side, or I use a 9-inch square pan, although the fudge will be a bit thinner. In a microwave-safe bowl, place 2 2/3 cup butterscotch chocolate chips (This is more than a 12-ounce bag, so be sure to buy at least two bags). Microwave at 70 percent power for 90 seconds. Stir well, using the residual heat to completely melt the chips. If necessary, continue to microwave at 15 second intervals. Stir until the chocolate is very smooth. Alternatively, if you prefer to melt the chocolate on the stove-top, set a heat safe bowl on top of a sauce pan of simmering water, making sure the water doesn’t touch the bottom of the bowl. Stir the chocolate until melted. Once your chocolate is melted, stir in one 14-ounce can of sweetened condensed milk, 1 teaspoon rum extract, and a pinch of salt. Note below, I show you what rum extract looks like. 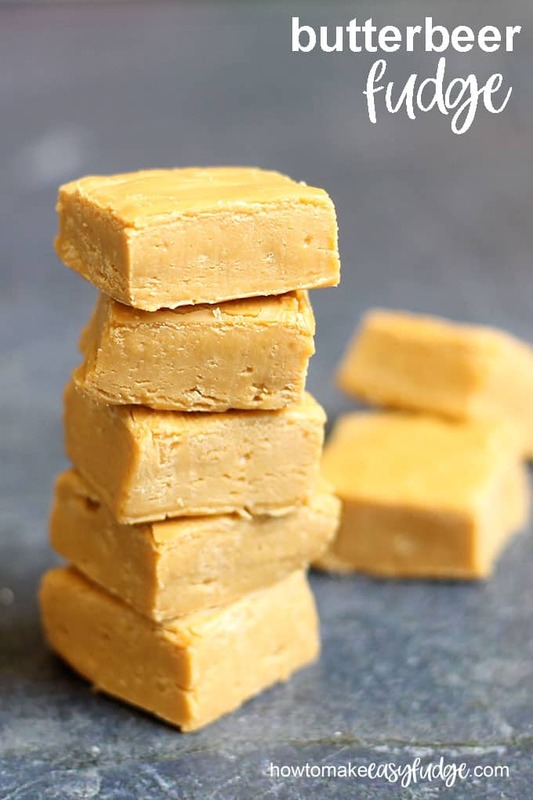 Unless you’re making butterbeer fudge everyday for a year, you won’t need a six-pack of rum extract. I advise buying this ingredient in the supermarket for a much lower cost. If this recipe is primarily for children, consider reducing the amount of rum extract added to 1/2 teaspoon. It is a strong flavor some kids may not appreciate. Pour the mixture into the prepared pan and spread evenly. 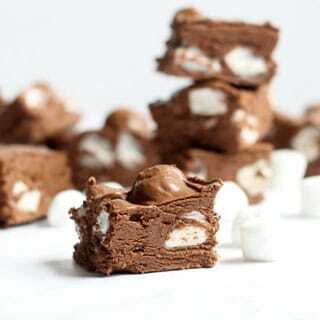 Refrigerate the fudge for 2 to 4 hours to full set and cut into squares. 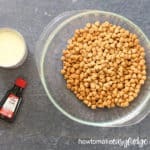 can I use evaporated milk instead of condensed milk? NO! 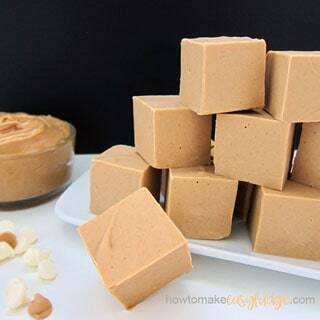 Make sure to NOT interchange sweetened condensed milk (which is more of a sugar syrup) with evaporated milk (which does not have sugar added and has more water content). 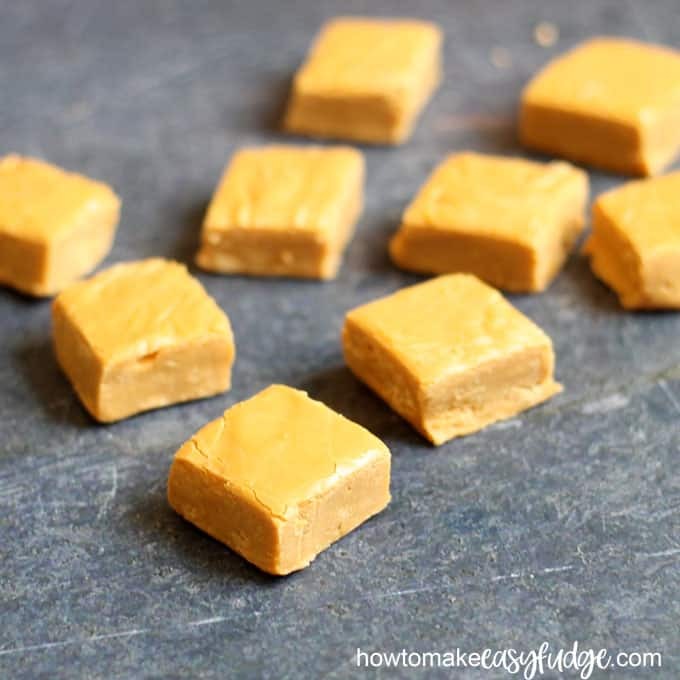 Some fudge recipe do use evaporated milk, because it is a more stable ingredient and can be cooked to higher temperatures without curdling than regular milk, but recipes that use evaporated milk in place of regular milk are more likely to have more traditional candy-making steps. The two different types of canned milk are almost always on the grocery store shelf right next to each other, so be sure to choose the correct cans. 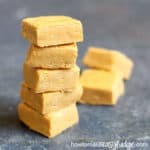 Delicious, easy butterbeer fudge, with only 4 ingredients, is the perfect Harry Potter party food. Prepare an 8-inch square baking pan. Line it with lightly greased parchment paper or non-stick foil. In a large, microwave-safe bowl, place the chocolate chips. Heat at 70 percent power for 90 seconds. Stir well, using the residual heat to melt the chips until smooth. If needed, heat at additional 15 second intervals. Alternatively, you may melt the chips in a bowl set over a saucepan with simmering water on the stovetop. 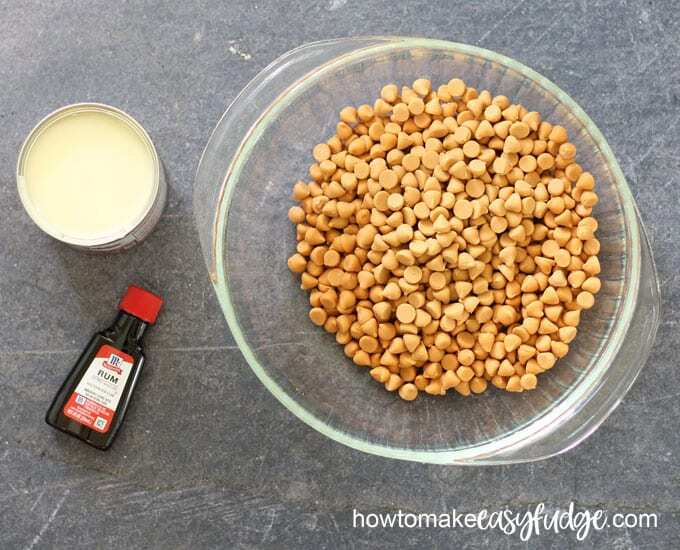 Add the sweetened condensed milk, extract, and salt and stir well. Pour into the prepared dish. Refrigerate for 2 to 4 hours until firm. Cut into squares. This butterbeer cake looks divine. Oh my to these butterbeer cupcakes. Have to try this one for sure for my HP friends. Thanks for posting! My grocery store sells small bottles of “imitation rum flavor”- could that be substituted for the rum extract? You are welcome! You can definitely use the imitation rum flavor. Start by adding half as much then add more until you get the flavor you like. Enjoy!